One of the most impressive social media success stories of recent times is make-up company Glossier. Even if you haven't become one of Glossier's super-fans yet, you most likely have heard a friend talk about their products, seen their social media content, or read about the company being recognized for its innovation. Part of the allure of Glossier’s success is the mystery of it all - how did it grow such a huge (and loyal) consumer following so quickly? What does an upscale beauty brand do to attract 1.9 million Instagram followers, and counting, in less than 5 years on the market? A huge part of Glossier's success comes back to one of the buzz terms of the moment - "brand authenticity". If you show any Millennial beauty industry consumer Glossier’s Instagram profile, without captions, they’d likely still be able to identify it as Glossier’s right away. Note, we’re talking about Instagram only here. The company has focused on Instagram specifically, because that’s where its target audience are spending the majority of their time. Want to learn the secrets behind Glossier's success on Insta? Curious how your business can mimic their tactics? Whether you're a B2C brand like Glossier, or a B2B company, you can learn a lot from this company's innovative social media marketing approach. Here are three things Glossier gets right with its Insta presence. Glossier hit the nail on the head when drafting its buyer personas. A selfie, a meme, a cute animal video. Glossier did its research, and it knows that its target audience already has a feed filled with all these things. As such, the company gives its audience what it knows they like - in this case: pretty pictures of flowers, memes, cute animals, etc. - and these posts slip right in alongside their friends and another funny meme accounts. It's worth noting that the vast majority of Glossier's posts are product related, helping to build its brand, but it adds in additional snapshots of web trends, and ties them back into its brand. For example, this is what Glossier used when letting its audience know about a product coming back in stock. No, I'm not telling your HR software brand to forget everything and go post cute selfies every morning, but the approach highlights the importance of knowing your audience, picturing what their day-to-day social feed looks like, and working to conceptually and aesthetically blend in. Glossier walks, talks, and looks like what its customers want their own profiles to look like, adding to the "cool girl" allure of its overall branding approach. 2. It stays "on brand"
Color palettes are incredibly useful in branding - for example, DesignAdvisor says that 80% of brand recognition regularly comes from color impression alone. Glossier, in its approach, has essentially cornered the market on Millennial Pink and light grey, boosting brand recognition - as noted, many people would now know Glossier's content from a posted image alone. Consistently like this is key to maximizing brand recognition on Instagram, and identifying two or three colors that fit with your brand’s marketing goals (see our color psychology infographic for details), and maintaining them as a regular thread across your posts will certainly up your Instagram game. Whether you're marketing to the everyday consumer, or a corporate business, having a recognizable brand will help grow your credibility, and improve broader awareness and reputation. Another option on this front is to use the same filter/s on every Instagram post, further enhancing that uniform, consistent approach. According to Weiss, almost 80% of customers are now referred to a brand by a friend. "Now [with social media] we can connect you with even more members of our community, and suddenly the social element is activated in a way that it's never been before when you are buying something on the internet." How does Glossier go about this? Glossier seeks to regularly interact with its audience on Instagram, and bring them together. 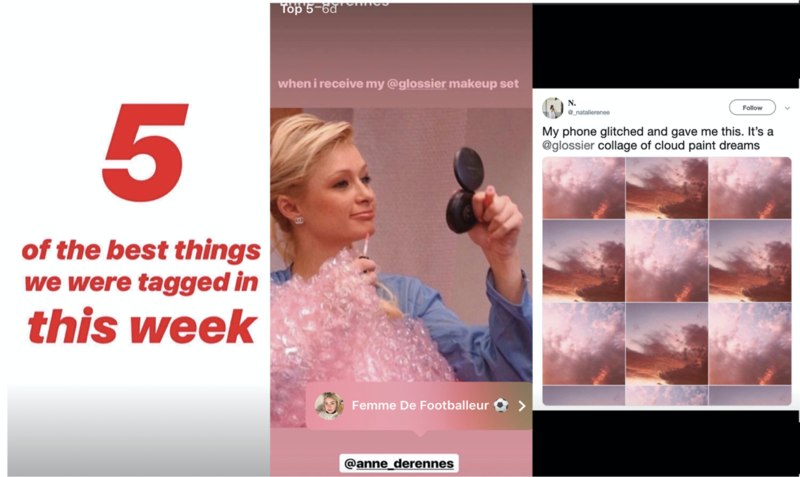 Take Glossier's “Top 5” Instagram Story Highlight, for example - for this, the company finds five of the top posts it's been tagged in for the week, then it posts each to its Stories feed and saves them into the specific Highlight on its profile. In the re-post, Glossier tags the original poster, so that whoever sees it can also connect with that user on social. But they don’t stop at just that Highlight - Glossier also does the same thing with its seasonal “Resolutions” Highlight, connecting users through sharing their resolutions on Instagram. This helps further enhance the community around its brand, connecting top fans to each other, and further fueling that interest and passion about its products. There's a lot going on in Glossier's Instagram feed, and a lot you can learn from how the company goes about engaging and connecting with its audience. But it clearly knows what its doing - Glossier has amassed a huge Instagram following, and continues to expand its community through consistent posts and community engagement.